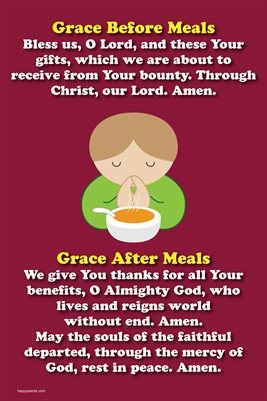 Grace Before and After Meals: Bless us, O Lord, and these Your gifts, which we are about to receive from Your bounty. Through Christ, our Lord. Amen. We give You thanks for all Your benefits, O Almighty God, who lives and reigns world without end. Amen. May the souls of the faithful departed, through the mercy of God, rest in peace. Amen.